“All right! Now we can have a neck and neck competition,” Juan says. “This is our chance to shine!” Latisha says. “I know you know a little about addiction. However, this mission will help you answer the question that’s been on all of our minds,” says Corty. “Who’s going to win the competition?” suggests Juan. Corty says, “What else do drugs do to the neurotransmitters – Brain Power!kids?” Beth and Juan exchange glances – they’re not sure. “Yeah. Addiction changes the brain so that even if someone stops using a drug, it takes a while for the brain to get back to normal. And sometimes it never does,” says Juan. “Right. Spectacular Scientistskids, what can cocaine do to someone who uses it?” asks Corty. Latisha and Jay look at each other and shrug – they don’t know. Corty asks, “Do you know what class of drugs cocaine is in?” They look at each other again and shake their heads. “Cocaine is a stimulant,” Beth says. “We didn’t learn about stimulants,” says Jay. “The Brain Power! kids did. Hmmm. Should have worked together. I’ll bet the Brain Power! kids can’t tell us what effects inhalants have on the brain,” says Corty. Beth and Jay look at each other and shake their heads. Latisha says, “Inhalants affect the cerebral cortex, the cerebellum, and the brain stem.” “We didn’t learn about inhalants,” says Juan. The kids sigh and look unhappy, finally understanding that they should have worked together and feeling bad that they didn’t. “Let’s do it!” says Latisha. The kids pull out their charts and body outlines, and exchange notes on what they learned. Corty says, “Well, let’s figure it out now. We’ll start by learning some more about addiction. Do you know some of the signs of addiction?” The kids look at each other, and then shake their heads. They don’t know. Corty says, “One is called tolerance—the longer someone takes a drug, the more of the drug they need to get the same feeling from it. Of course, a person is supposed to continue taking drugs that a doctor prescribes for him or her for medical reasons. That person would not be considered addicted to those medicines. Another sign is compulsive use—when someone needs to use a drug over and over again, even if bad things are happening, like with the people they love, or their job, or with the police! And then, there’s withdrawal. Do you know what that is?” The kids shake their heads. Corty says, “That’s when people need the drug to keep from feeling bad. 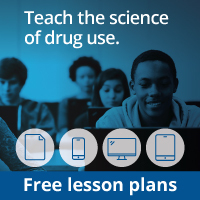 With cocaine, for instance, if a user can’t get it, they get depressed and nauseated, and they feel like they’ll do anything to get it.” The kids are listening closely. Stop here until students have finished their scrapbooks. “Very good! Excellent teamwork. So, can you sum up what you’ve learned in these six missions?” asks Corty. They go over to the blackboard and whisper together for a moment. Then Jay writes the answer on the blackboard, complete with happy and sad faces. The kids each grab a shirt from a pile Corty indicates. They put them on, and jump up and down in their excitement.